Ladies, how about pearls this autumn? Crikey, I never knew that the old classic can add such a charming little accent to elegant top knots or loosely twisted low buns without looking wedding-y. Having said that, I’m totally smitten with this modern twist. You? P.S: On a more serious note, those of you affected by the Hurricane Sandy I hope you're all safe and well! I love the pearls for the hair. It's such a nice touch and very timeless!! I remember this being a real go-to style for my sister and her friends for prom and dances back in the early 90s (with smaller pearls of course). Love the pearls in the hair. so pretty! i don't think i could pull of having the pearls all around in real life but i like the idea of a few right around the bun. So fab! 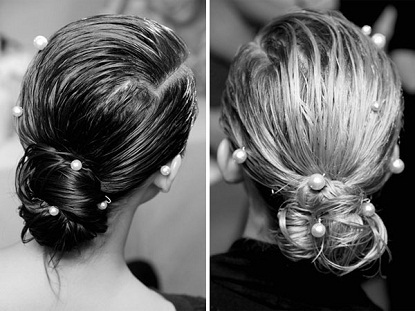 Love to have this pearl n bun look. Gotta pin them. Got my eye on your next posts. Alleen, timeless indeed:) Love that! Totally agree, Chapstick Fanatic! A few around the bun itself would look so pretty and sassy.